The evolution of open-plan living is really taking center stage at the moment. There is a move away, that sill keeps the feeling of visual space, but works on a more practical level, rooms that have been given the “broken-plan” treatment. For decades now, homeowners all across the UK have been in love with homes that offer us the open-plan look. These rooms bring a grand sense of space, light and are often high on our priority list when we think about acquiring our dream property. 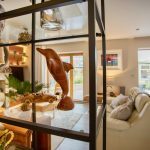 The challenge now comes from Interior Designers who are interested in zoning out the open space to create rooms within rooms, in an effort to achieve a more comfortable home that feels welcoming and personal.https://www.chameleondesignsinteriors.co.uk, work with many clients that want to create this feeling of openness and flow, creating spaces for modern lifestyles. These spaces still have the ‘grand designs’ look that we’ve always wanted, but have a feeling of intimacy and are never overwhelming. But how to go about creating the look? Well, our broken-plan rooms now use dividers that can finish near ceiling height, or colour or texture changes on the floors or walls. Furniture too, can literally zone a space by creating a physical barrier, encouraging people to walk around them or just to focus on another part of the space. Freestanding shelving units can be used to great effect when separating a cooking space from say a dining area. The construction needn’t be a solid barrier, either. In fact, rather better would be a unit that allows light to pass through with glimpses of the room beyond and serves to highlight a personal collection, while gentle delimitating the space. 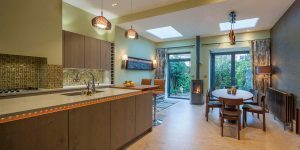 Given that more of us are working from home, this could be a welcome relief from the idea of simple setting up a computer in the kitchen, as it allows us to build a dedicated space within the larger room. 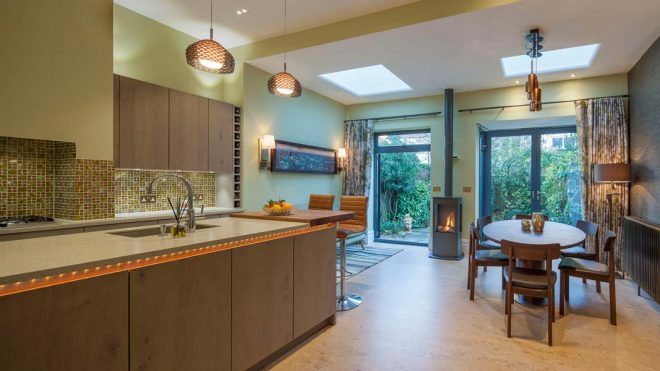 The ever-popular Crittal style windows are offering designers massive opportunities too, carving out gentle spaces within the more conventional open-plan look. These adaptable glass dividers function as walls, but offer so much more because of their semi transparency – with darker frames acting as a barrier between what is in front and what lies beyond. We recently combined this on a project for a client using Crittal style shelving to create a zone of the living space from the kitchen/dining room. Don’t worry if you think all this is taking a backward step- rest assured it most certainly is not. No one ever wanted the dark, poky little rooms that we inherited from our grandparent’s and it’s unlikely we ever will. 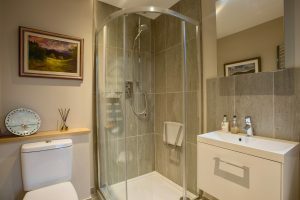 It is just that the feeling of greater intimacy in a broken-plan room offers more opportunity for a 2018 household, particularly in a multigenerational home. I can think of nothing more wonderful than preparing a supper party for friends with guests mingling in one space, while some are busy in the kitchen area and others are in the living space. And who knows maybe granny is still part of the overall scene, but in her own quieter zone away from the noise and mayhem, but still very much part if the conversation. We at https://www.chameleondesignsinteriors.co.uk as Interior Designers, based in Norwich, working across Norfolk, Suffolk and Cambridge are specialist in planning and creating space and flow. Making those spaces work for you and creating rooms and spaces that offer something different.